Early in the morning, Kate grabbed her sling and baby and said, "Sling the baby, mommy?" I helped her get the baby in and adjusted and she looked at me for direction. "You are wearing the baby in the sling, so you can do whatever you need to do and she'll go with you!" "Okay!" 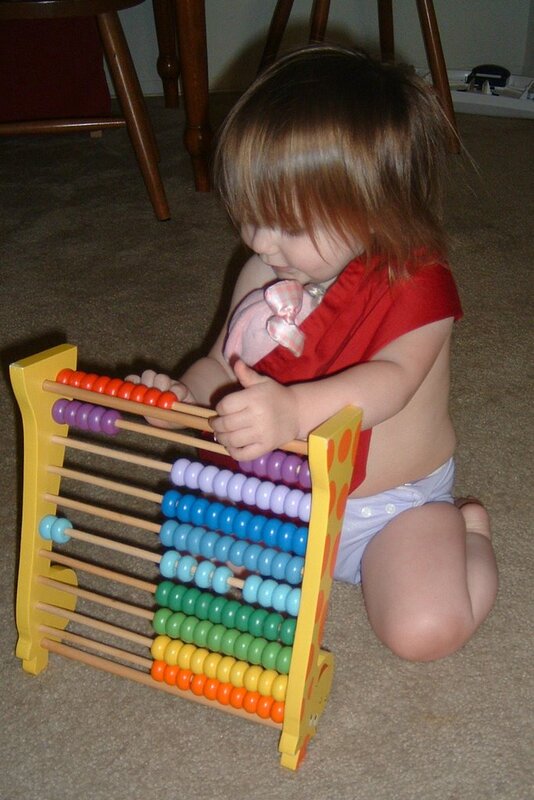 She found the abacus and started to count. Later, she said, "Mommy, the baby needs BREAD." "Kate, babies have mommy's milk, not bread." "Dis baby needs bread." "You know what she needs!" I handed her the bread and she proceeded to pretend to feed the baby for at least 30 seconds before scarfing it herself. We went strawberry picking today (all four of us and Aunt 'Nay) and Kate had a great time picking "stwawberries" and putting them in the "buc-key." She really loved eating the fruits of her labor as well! "As long as it's talking with you / Talk of the weather will do"
Kristen - Kate, I need to take you outside and put you in the car so we can go to church. Kristen - No, it's cool today. Kate - Cold and windy? Kate - Rain? [we go out the door.] No rain! For the visual among us, there are some new pictures in her album. We did give Kate the faux-crocs for Easter, and she loves them. 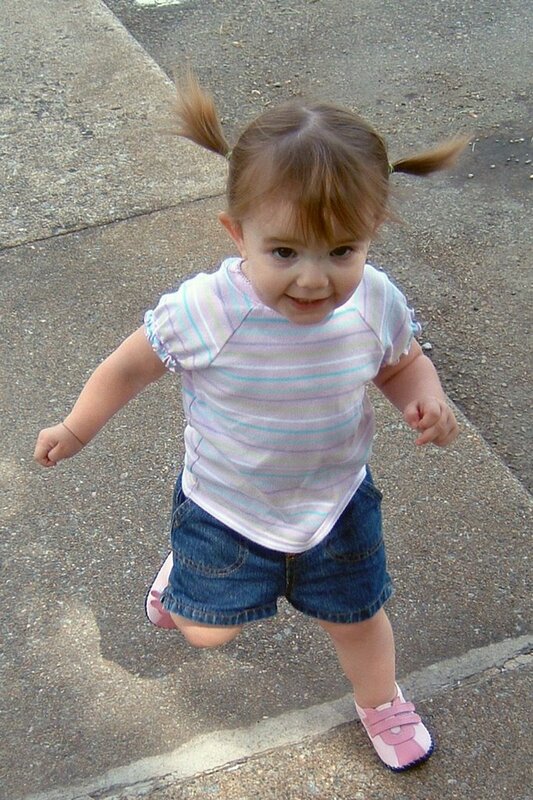 She walks around, notices the shoes, and stops to say, "ooooh! red shoes!" before she continues on. It cracks me up. 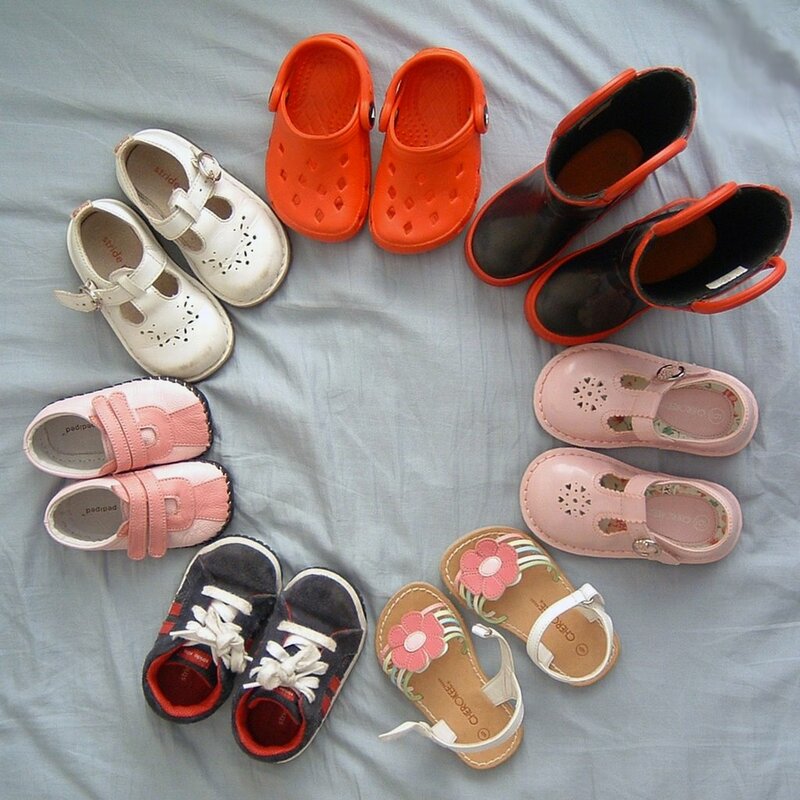 The photo shows all of her current spring/summer shoes that she fits into. Kate is 22 months old today and simply blossoming. I am astonished at her development and how quickly she grows and learns right before my eyes. She's using hundreds and hundreds of words and learning a dozen or more every day. She woke up last night and I went into her room and asked, "what's wrong, sweetheart?" and she replied, "I'm SAD, Mommy!" Her motor skills are developing, too. A few days ago she found a puzzle set I had bought last year for her to grow into (and to share with older kids who come over until then.) There aren't pegs on the pieces and the age range is 3+ so I wasn't expecting her to be interested. She immediately caught on to the nine shapes puzzle and after helping her do it the first time she can now complete it in a minute flat. She asks to read and likes to summarize the stories in her own little way. She's also started to eat what we do for dinner and uses utensils with some ease. She's went over to hang out with some friends while Mike and I went on a date (with the baby) a few weeks ago and they set her a little place with a plate, spoon and a fork and she proceeded to eat Club crackers with a fork and spoon!